Have you tried the new fries at Wendy's? 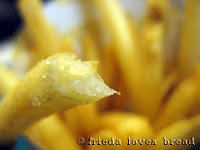 Thanks to Wendy's and Foodbuzz, I was given an opportunity to try their new natural-cut fries, and so can you! I am picky about bread at Italian restaurants; rice at Chinese restaurants; chips and salsa at Mexican restaurants; and yes, fries at hamburger establishments. hot, crispy, fluffy, thin and have just the right amount of salt. These are skin-on potato fries. I don't mind that one bit. I take a bite. Hot. Crispy on the outside. Hint of sweet sea salt. I check the inside. Fluffy. 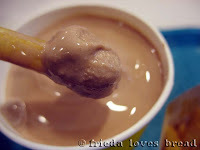 Whenever I go to Wendy's, I have to get a chocolate Frosty. It's so thick, you have to eat it with a spoon. I've tried using a straw and no amount of sucking will move the shake up to my mouth! But what about a french fry? The perfect combo of salty and sweet. Verdict? I love these fries much better than their previous, thicker fries. Do you want to try Wendy's new fries? I know you do! Guess what? I have a $10 gift card to give to one of my lucky readers! All you have to do leave a comment on this post telling me what you like to eat at Wendy's and you are entered! One comment per person, please. Giveaway Ends midnight MST December 13, 2010 and is open to U.S. readers. Wendy's through Foodbuzz provided me with the gift cards. Review and opinions are strictly mine. I like their chicken deluxe sandwich. My favorite is the chocolate frosty with the cookie dough. Ummmmm (As my eyes roll back in my head)... :) YUM. I love their Jr. Bacon Cheeseburgers and their frostys. It's all about the frosty. I'm a total sweet tooth! I like the frostys and a bowl of chili. I love their new fries. Delicious! I had my favorite from Wendy's for lunch today. I picked up the Pick 2 deal for my mom and I for lunch. Love their Chicken Apple Pecan salad with the blue cheese, dried cranberries and pomegranate dressing. Since it's f-f-f-fr-fr-freeeezing I paired them with some nice hot chili. I like the salads! But you can't go wrong with fries with a ketchup/mayo mixture. I love Wendy's for their variety of healthy food. Not that I go there for health food, but I can get a potato or salad while my kids get hamburgers or nuggets. I also like getting mandarin oranges with the kid's meal (I'm a kid at heart!). I love their spicey nuggets!!! and I have been wanting to try their new fries! Frosty! And a chili topped baked potato is delicious too! A single with cheese, mustard, pickle and onion. 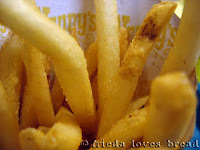 I'd love to try their new fries but I REALLY loved their old ones... more than any other fast foods. FROSTY! And fries with ketchup. Haven't tried the new ones yet, though. The new frys are yummy. What I like about Wendy's is the Apple Pecan Chicken Salad with Pomegrante dressing. I love the jr. bacon cheeseburger! I love Wendy's chili! I buy a couple cups of it, add a can of corn and a can of chili beans, toss it all in the crock pot and my family calls it homemade! I'm definitely all about dipping the fry in the frosty! My favorite for sure! I love the cheap stuff. Dollar menu. I like their grilled chicken go wraps. Molly via RSS feed: We love Wendy's chili and spicy chicken sandwich!!! I LOVE fries and frosties together! I've been eating that since jr high. Thanks for a chance to win! Love your blog. I like the Classic Burger..no mustard please! Also like a baked potato. junior bacon cheeseburger and fries!!! 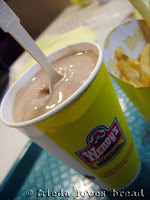 A frosty with fries! I might have to go tonight and get one for me and the hubby. You can't have too much chocolate. Worked at Wendy's in the 80's. Learned to love mayo on fries. I like ALL their food! I really do want to try these. I haven't been since the BIG change. I hope they are better than the "old" ones...because I don't like them so much. 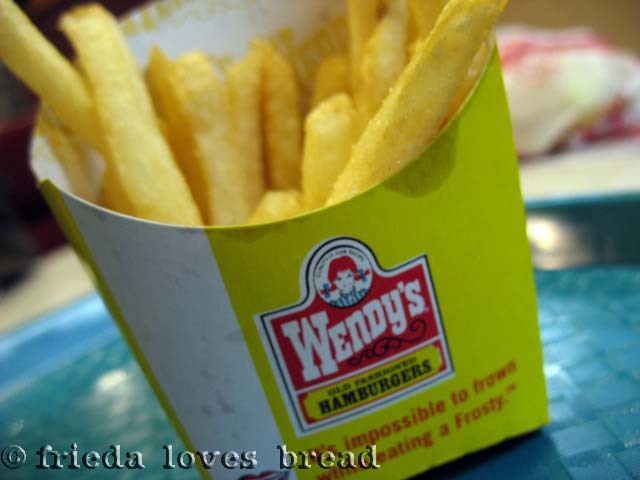 I love Wendy's. Usually order a Single - no pickles but often chili, baked potato or salad. It's all good food. My new fav is the Vanilla Frosty! !